Tim Harbold: Bio & Choral Music | Santa Barbara Music Publishing, Inc.
Tim Harbold, conductor, arranger, and pianist, is an Associate Professor of Music and Choral Director at Wheaton College in Norton, MA, where he has conducted the Wheaton Chorale and Chamber Singers since 1995 in repertoire ranging from classical masterworks to world folk songs, spirituals, and jazz. 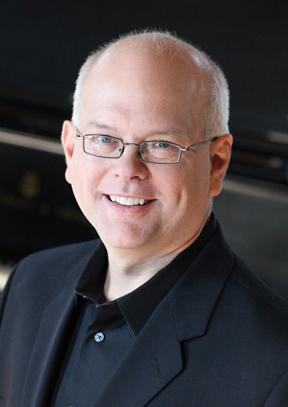 His choirs have performed in master classes with Simon Carrington, the King’s Singers, Rockapella, and Take 6. Harbold also directs the Oure Pleasure Singers, an advanced chamber choir based in Attleboro, MA. His arrangements of spirituals and folk songs have been premiered by groups such as the New England Conservatory Chorus and Chamber Singers, and by the New England Conservatory Camerata. As a pianist, Mr. Harbold specializes in American song, performing regularly with vocalist Valerie Anastasio. The duo have paired with Benjamin Sears and Bradford Conner to create two popular shows that have toured New England and New York: Their CD tribute to Noel Coward and Cole Porter, Noel & Cole: Together With Music, was lauded by Billboard, and their second show, Fred & Ethel: Great Songs of Astaire and Merman, was twice nominated for Best Cabaret by the Independent Reviewers of New England. A new CD, Marching Along with Time, features Irving Berlin’s songs 1935-45. Mr. Harbold studied music at Williams College, and conducting at New England Conservatory, where he was a student of Tamara Brooks. Tim Harbold has 1 titles published with Santa Barbara.